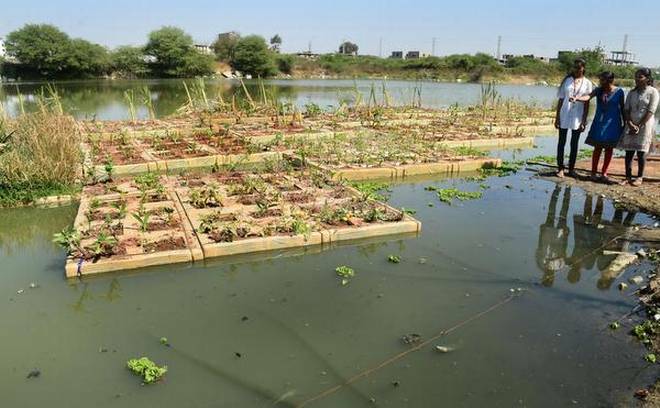 India’s largest Floating Treatment Wetland (FTW) launched in Hyderabad’s Neknampur Lake. The Floating Treatment Wetland (FTW) on Neknampur Lake was inaugurated on World Wetlands Day (February 2). The size of the FTW is 3,000 sq. ft.It has been formed by the joint efforts of Dhruvansh, the Hyderabad Metropolitan Development Authority, the Ranga Reddy district administration and other organizations. It has been named the largest FTW in India by the India Book of Records. It has been developed based on soil-less hydroponics technique.The FTW is planted with cleaning agents like vetivers, canna, cattalis, bulrush, citronella, hibiscus, fountain grass, flowering herbs, Tulsi, and ashwagandha. These plants absorb excess nitrates and oxygen present in the water and reduce the content of these chemicals. It is said that this method is very cheap compared to sewage treatment plants.